The MPOLx from VIAVI Solutions, the industry’s first dedicated optical loss test set that can perform all MPO Tier 1 (basic) test and certification requirements, including the need to test for length, optical loss, polarity and inspect fiber end-face condition. With the ability to meet all Tier 1 (basic) requirements in a single solution, the MPOLx helps technicians ensure a fast and reliable workflow, delivering comprehensive test results in less than 6 seconds for all 12 fibers. Provides users with full visibility and control from both the light source and power meter. 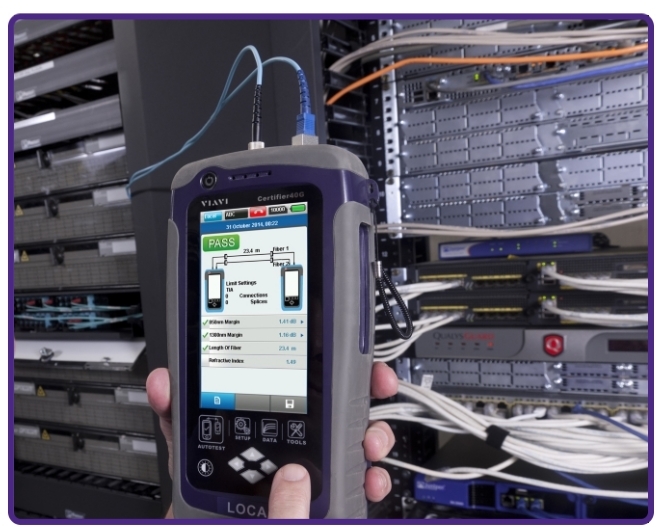 In addition, MPOLx simplifies fiber inspection with automated pass/fail analysis for both ends of the MPO connection. The Sidewinder from VIAVI Solutions is the first solution on the market to completely automate the multifiber inspection process with industry-leading reliability and speed. Technicians can receive automatic pass/fail results for all 12 MPO fibers in less than 12 seconds; a typical job of certifying 100 MPO connectors can be completed in under 20 minutes, compared to the industry average of 4.3 hours (a 92 percent reduction). Endface quality can be certified to customer requirements, including IEC-61300-3-35. All-in-one design provides autonomous operation with features including auto-focus, auto-pan/scroll, endface analysis, colour touch screen, on-board storage & Wi-Fi connectivity to mobile devices. The Certifier is the world’s most comprehensive solution for enterprise network certification. Available in 2 models-the Certifier40G can test both copper and fiber cabling types to ensure network performance for all current and future cabling standards, and the Certifier10G - a cost-effective solution for testing and certifying copper up to Category 6A. If you have any questions, don't hesitate to contact us. We look forward to assisting you. Utlising our FREE "Click to Call" service (enter your name and your phone number, then your phone will ring and connect you to our office). Alternatively, if you are calling from outside Australia please call +61 3 9265 7400.